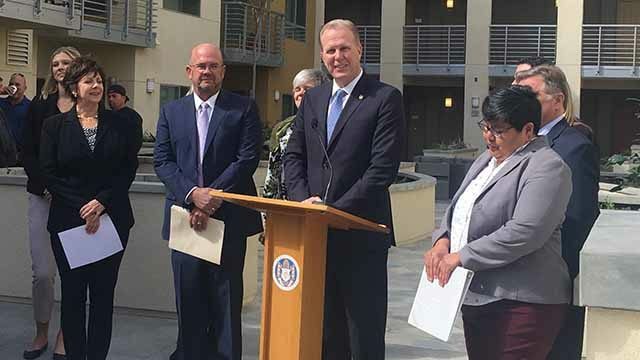 Mayor Kevin Faulconer called on the City Council Wednesday to pass dozens of proposed code changes that he says would help increase the supply of housing, lower development costs and promote smart growth. Some of the proposed changes would build on the state’s required 1978 Affordable Housing Density Program, which allows developers to build more housing units than typically permitted on a given project, provided some of the units are affordably priced. But Faulconer is proposing changes that would go beyond that program and offer further incentives for developers to provide affordable homes. Among the changes are offering a 10 percent density bonus for projects not going beyond the maximum permitted building footprint, allowing developers to participate in the program without specifically requesting a density bonus and allowing a 100 percent density bonus for “micro-unit” developments that do not go beyond the permitted building footprint. Faulconer is also pushing for 47 updates to the Land Development Code that would streamline the project review process and hopefully increase production, he said. Among the changes are easing of regulations to create more live/work developments, where housing and commercial enterprises are co-located in one unit; creating parking exemptions for some historic structures; changing parking requirements for developments near transit centers and changing ground-floor height limits in mixed zones to 13 feet, which would allow the construction of three-story buildings in zones where they are currently not allowed. The proposals are the latest in Faulconer’s Housing SD initiative and were teased during his State of the City address earlier this year. Since last June, the city has made the following several changes as part of the initiative — expediting certain affordable housing permits, changing the municipal code to promote the construction of so-called granny flats and creating a streamlined environmental review process. The council will consider the proposals March 6.